China FDY DTY POY-Hangzhou Zhongli Chemical Fiber Co., Ltd.
We specialized in producing Dope Dyed Colored Polyester Yarn FDY, DTY, and POY Now, annual output of more than 70,000 Mts, we have developed more than 1,000 different colors. The bigger manufacturers of Dope Dyed Colored Polyester Yarn in China, Hangzhou Zhongli Chemical Fiber Co., Ltd. has played very significant roles in the colored polyester yarn manufacturing fields for many years. In recent years, with active efforts in exploring overseas markets, we have built favorable & stable cooperation relationships with more than 80 different countries. Now we export more than 100 containers per month and our annual export value is more than 40 Million US Dollars (USD 40,000,000). We believe in ‘ Quality First, Technology Goes Front ’ and we make this our basic business principle. According to the requirements from different clients, we develop our yarn with high color fastness, low break-up, and comfortable feeling. Meanwhile, relying on the flexible management and powerful technology teamwork, our company has been honored as been leading the colored polyester yarn industry in China. 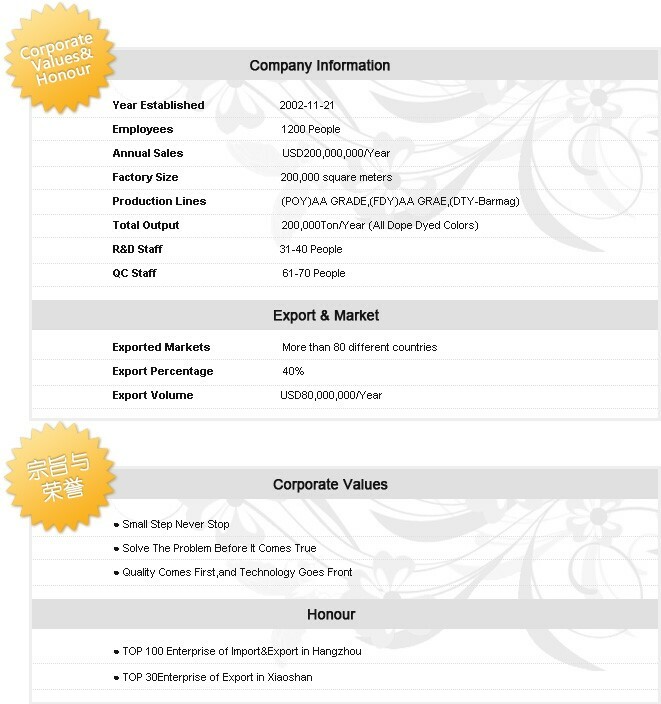 Now Hangzhou Zhongli Chemical Fiber Co., Ltd. is ‘ Top 100 Export and Import Enterprises in Hangzhou ’ and ‘ Top 30 Export Enterprises in Xiaoshan ’.